Have you read through your homeowners’ insurance policy lately? Probably not, it’s not exactly leisurely reading material. The truth is, that these policies are long and complex. At Pro Response Restoration we want you to feel prepared with the information you need if there is damage to your home. -Homeowners insurance provides financial coverage for your belongings and home in the event of damage, destruction, or theft. Policies provide protection against hurricanes, tornadoes, theft, and even civil upheaval. -There are several different types of policies, each one with specific coverage. Be aware that most standard policies do not provide coverage for poor maintenance, general wear and tear, or damage caused by floods or earthquakes. WHAT POLICY DO I HAVE? WHAT DOES MY POLICY COVER? -There are 9 different types of homeowners’ policies and they are referred to as forms. Your reimbursement for loss varies depending on which type of policies you purchase. To be reimbursed for damage a peril must have occurred to cause your loss. A peril is a term for a specific risk or reason for loss. 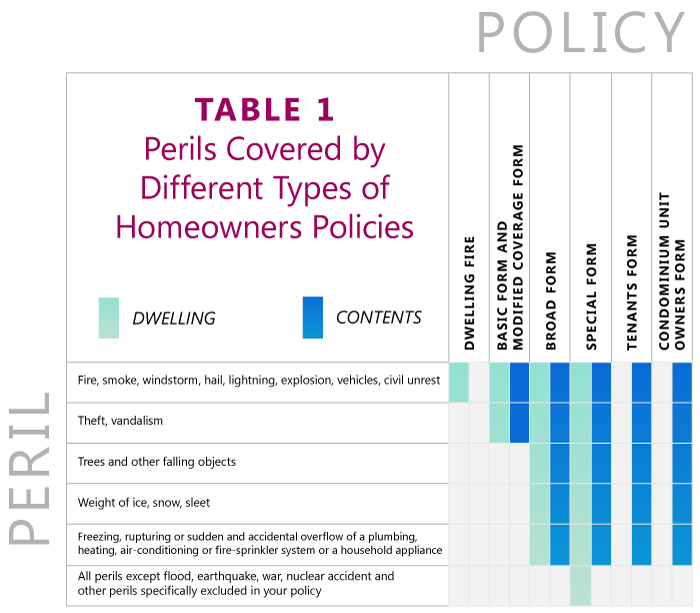 Table 1 below shows the different policies and what they cover. – It is vital that you understand what perils a policy will cover and that you have the coverage you need in case of loss. Your insurance agent should be able to direct you on amounts of coverage you may want to consider on your home. –Read your policy and be aware of terms used. Some are very broad, and others may be more restrictive. Pay close attention to how the insured and insured location is defined in the policy. – Additional coverage may need to be purchased to cover other possible threats to your home and property. Be aware of perils your policy does not cover and consider purchasing additional coverage. Some perils can be covered by adding an endorsement, for others you may have to purchase an additional policy to cover a specific peril or item of property. -Reasons you may want extra coverage are floods, earthquakes, wind & hail damage (in some areas), mold, sewage systems, and other plumbing or drain systems. Getting to know your insurance policy today will save you possible time and money in the future should an incident or emergency arise. If something in your policy doesn’t make sense, speak to your insurer right away so you are informed and have the coverage you need.